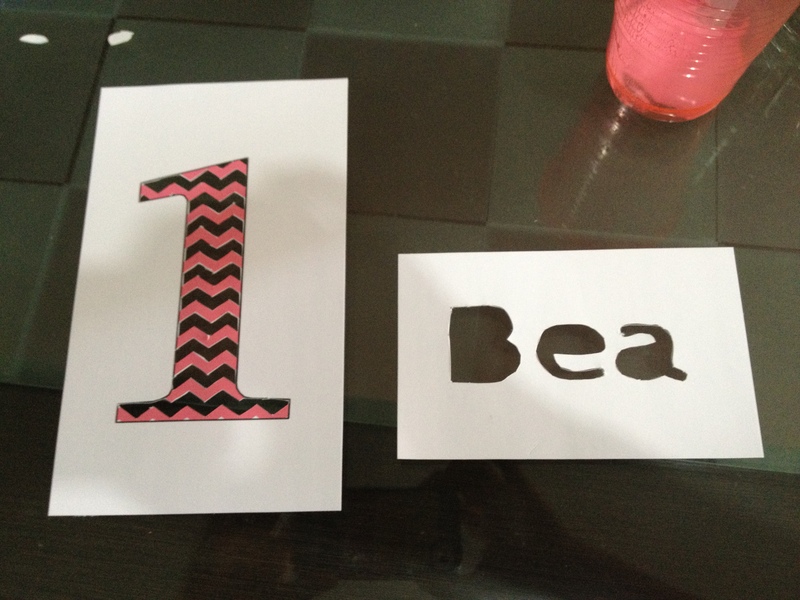 Little B’s first birthday came and went, but before that I had a birthday party to plan for. Pinterest put all these party ideas in my head but I only got to use a few of them. I had planned on a milk and cookies theme, but decided on a pink party instead. I always said my little girl would never wear one of those cutesy tutus, but that’s exactly what I made for her to wear for her party. As I said, I saw it on Pinterest and thought it would be fantastic if I could make one for Little B. I could just imagine her toddling around wearing her fluffy skirt. What to wear aside from the tutu though? 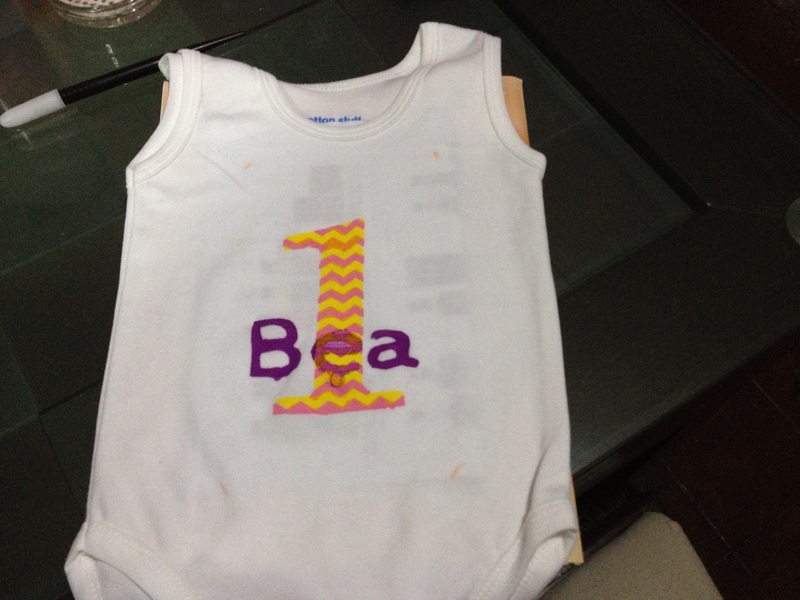 I stenciled a onesie as well. Tissue paper pom poms? Check. Banners and buntings? Done. But in this post, I’ll focus on the outfit I made for her. 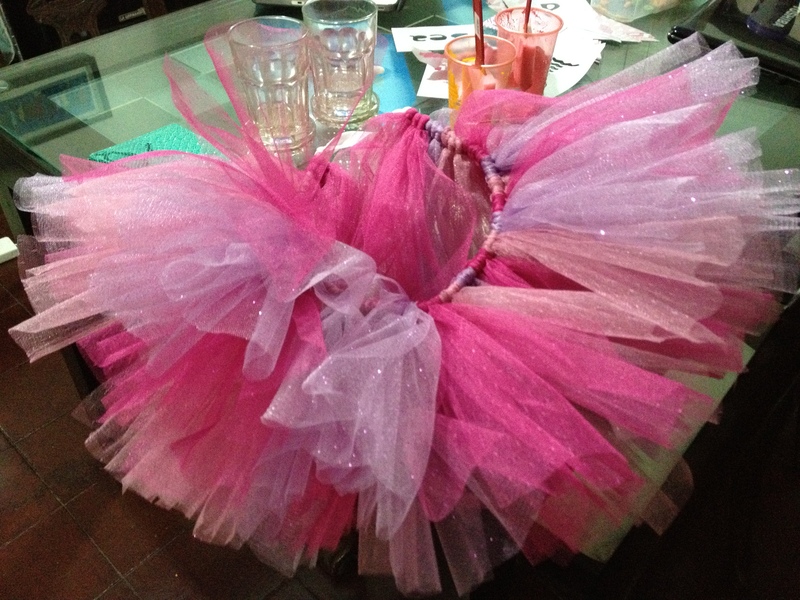 I looked up how to make tutus and found one site that made it seem so simple – Treasures for Tots. Next step was to buy the materials I needed to make the skirt. 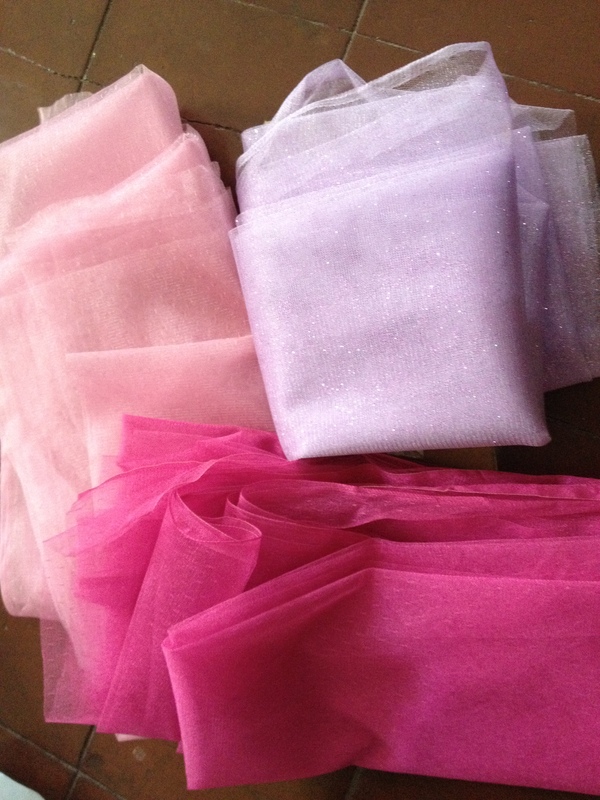 Unfortunately, in Manila, tulle doesn’t come in 6-inch width rolls so I estimated I needed maybe 3 yards each of 60-inch width tulle. Turns out, I ended up using only half the amount. I chose pink, fuchsia and lilac (with glitter). 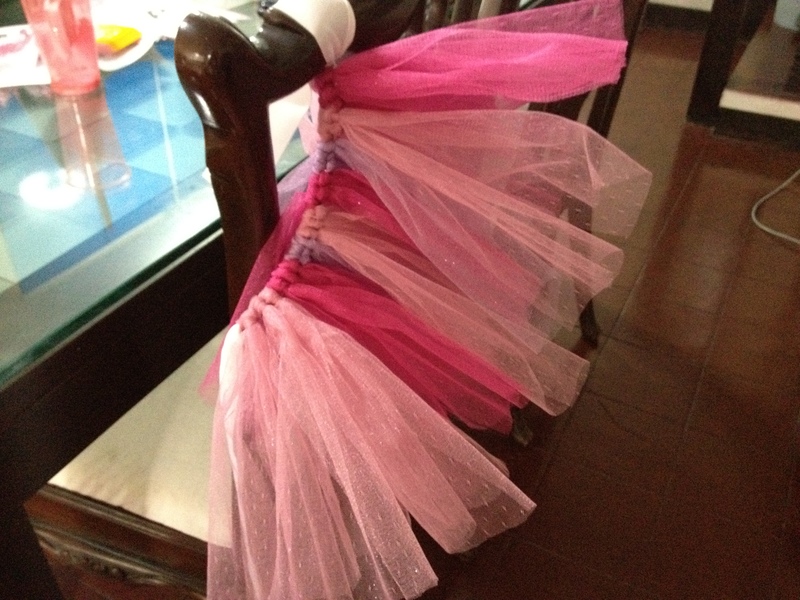 I also bought 18 inches of white ribbon to attach the tulle strips to. I alternated 3 strips of fuchsia, 3 strips of pink and 3 strips of lilac. After loads of cutting and knotting (with country music playing on my laptop – for some reason that’s what I felt like listening to that afternoon), this is what I had. Pretty, isn’t it? It looks better worn though. For the full how-to, visit Treasure for Tots. Next up, the onesie. I made the design using Photoshop then I printed it out on sticker paper. Every blog I looked at said to use freezer paper but again, in Manila we don’t have that. But thanks to a post I saw online, I found out I could substitute sticker paper instead. After printing it, I cut out the design with something like an X-acto knife . 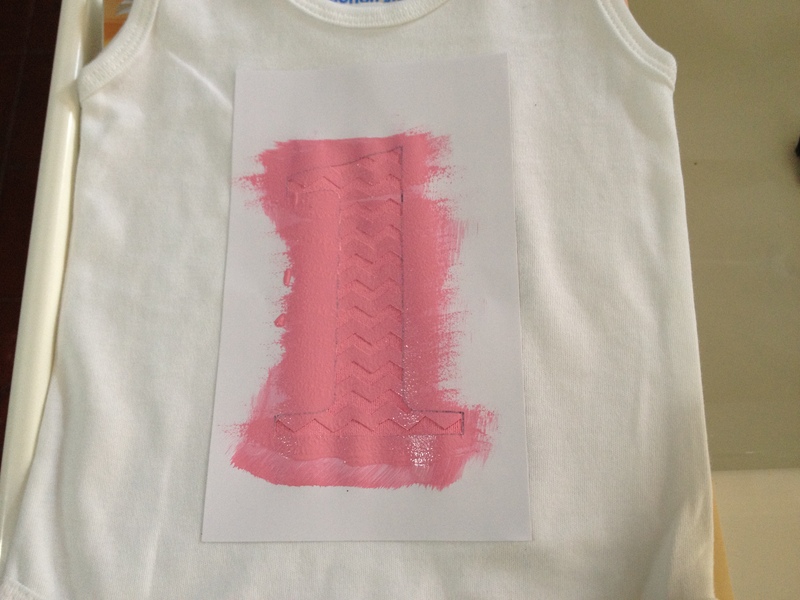 I removed the paper backing and carefully placed the stencil onto a plain white sleeveless onesie. Then I used fabric paint to paint the design. The lettering didn’t turn out so good. The sticker paper didn’t adhere well to the already-painted portion, so there was a bit of color bleeding that happened. But, I keep telling myself, not too bad for a first-timer.